My colonial Indochina story “The Moon over Red Trees” is up at Beneath Ceaseless Skies: you can read it here. This is something of a departure for me: I haven’t done historical fantasy in a while, especially not in that time period. Would be very happy to hear what you think. I’ve updated the story page of “The Moon Over Red Trees” with copious author notes: go here, though they’re spoiler-filled and better read after the story. Aliette de Bodard’s “The Breath of War” has a really neat science-fantasy premise: women in this world breathe people into life from stone, people who then become their companions and are necessary to breathe life, in turn, into children. Rechan is a somewhat rebellious woman, who abandoned her stone brother in the mountains as war broke out – and now that the war is over she climbs back to the place she left him. There’s a secret, of course: the true nature of the Stoneperson she gave life to, and it’s an interesting secret leading to a moving resolution. This, I suppose, is science fantasy at its purest: a rational-seeming world with mostly SFnal imagery, with a thoroughly implausible, but very fruitful, central conceit. The best story in this issue is probably Aliette de Bodard’s “The Days of the War, As Red As Blood, As Dark As Bile”, another in her long series of Xuya stories, taking place in the far-future of an alternate world where a high-tech conflict is going on between spacefaring Mayan and Chinese empires. This one is a direct sequel to her 2013 novella ‘‘On a Red Station, Drifting’’, taking place on an embattled and somewhat rundown space station whose inhabitants are faced with the prospect of evacuating in the imminent threat of an advancing alien fleet. It centers on a young girl struggling against but finally being forced to accept a peculiar kind of apotheosis; the scene where refugees are trying to escape the station during an attack is quite harrowing, so be warned. *happy writer* (and a shout-out to Benjanun Sriduangkaew, who gets called an “exciting new writer” and gets her story “Autodidact” recommended by Rich Horton. It is excellent, you should go read it–Benjanun is a finalist for the Campbell Award for Best New Writer this year, and stories like this are an excellent showcase as to why). Meanwhile, I shall go back to knocking my head against the wall to work out my novel ending. I need a liedown, but the universe being what it is, I will go and look for supplies instead. Just found out that “Golden Lilies” was among the top five stories of Fantasy Magazine as voted by the readers–along with stories by Jessica Lee, Camille Alexa, Aidan Doyle, and Cate Gardner. My deepest thanks to everyone who voted for it! In other news, I sold my Aztec steampunk story “Memories in Bronze, Feathers and Blood” to Beneath Ceaseless Skies, to appear in an upcoming issue. Many thanks to the Liberty Hall people who took a look at it, and to my WIBite pals for the help (including a new, catchier title and a better ending paragraph). Servant of the Underworld is an intelligent, involving and very rewarding novel which I have no hesitation in recommendation to one and all. An interesting and unusual setting, a well rounded main character (did you ever meet a priest of the dead being the good guy in a fantasy novel?) and a brisk pace. This novel has a lot going for it. -Lois Tilton reviews “Melanie” (in the February 2010 issue of Realms of Fantasy) and “Safe, Child, Safe” (an Acatl story in the last issue of Talebones). She thinks the learning displayed in glowing symbols on the arms in “Melanie” is “A Neat Idea”, and mostly likes the other story as well. 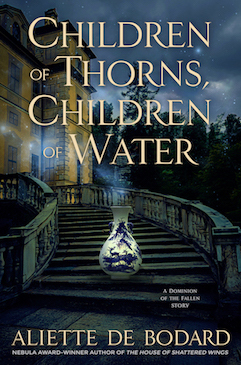 This makes Aliette de Bodard only the third author to receive two different story recommendations on this blog, joining Paolo Bacigalupi and Catherynne M. Valente. The particular setup of “In the Age of Iron and Ashes” refers to the Muslim invasion of India in the 13th Century. I read a series of elegiac texts about the loss this incurs, one of which featured a dancer on the walls of some Indian city, as a symbol of the beauty that was going to be lost in the carnage that followed. I can’t find the text for the life of me. I think it’s back at my parents’ place. For your listening pleasure: “Blighted Heart” is now available as a podcast (recorded by Beneath Ceaseless Skies). Go here (for the table of contents of BCS audio) or directly here for the mp3. 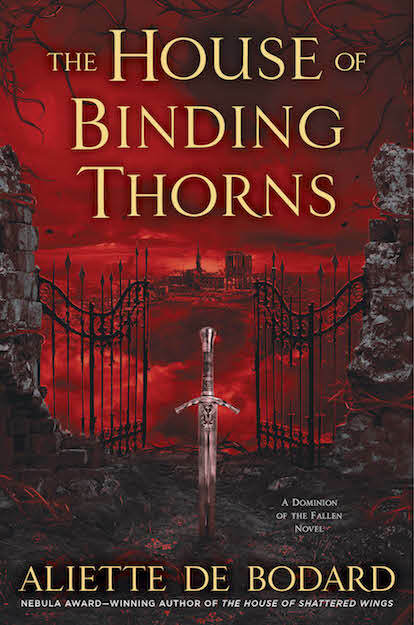 “Blighted Heart” is a powerful, beautifully written story, and a great example of why de Bodard was the runner-up for this year’s John W. Campbell Award for Best New Writer, losing out very narrowly to David Anthony Durham.